On the 27th of March 2008 at about 12:30pm, I boardedthe British Airways flight BA75 and I went straight toseat 53C. On getting to my seat, there were noises from anindividual being forcibly restrained but who was notvisible because some police officers and some plainclothes people held him down. The noise continued formore than 20 minutes and I was concerned because theindividual was screaming in agony and shouting inpidgin English "I go die" meaning, I will die. Ipleaded with the officers not to kill him and my exactwords were "please don't kill him". The BritishAirways staff said that the officers were doing theirjobs and that nothing was going to happen. The noisebecame louder and other passengers started gettingconcerned and were complaining especially about theirsafety. The situation continued for another 15 minutesafter I got on. Eventually, a member of the cabin crew announced thatthe passenger was going to be removed and thepassenger was removed from the plane and we allthought that was the end of the situation. Fiveminutes later, two members of the cabin crew arrivedwith about 4 police officers and told me to get offthe plane. I asked what the matter was and they saidthat I was not going to travel with the airlinebecause the cabin crew thought I had been disruptiveby questioning the noise being caused by the personthat was removed. I pleaded with them that I was goingfor my brother's wedding and that I had all his stuffwith me. I was dragged out of the plane as if I wasresisting arrest. As we got to the corridor thatlinked the plane with the terminal building, I wasslammed against the wall and made to sit on the floor.I was still pleading with them telling them that theyhad completely misunderstood me and that I was onlycomplaining about the situation regarding thedisturbances caused by the deportee they were tryingto restrain and subdue. I was on the floor for about20 to 25 minutes. Another passenger was brought to thecorridor as well and he was also pleading with theofficers. I was later put in the back of the police van at about1:50pm and I was locked up there for about an hour ormore still handcuffed. I was formally arrestedapproximately 2:30pm and my rights were read to me.Before the arrest in the van, I managed to reach formy pocket and brought out my mobile phone. I made somephone calls to my wife, sister and a friend while thelow battery sign was on because I was all alone andstill handcuffed.I was later driven to the police station where I wasformally checked in. I was in police custody foralmost 8 hours and later released on bail after theinterview with the duty solicitor and the detectives.I had £473.00 on me which was seized as well as £90.00sent to my mother in-law from my sister in-law and£1,050.00 given to me by my cousin who is a doctor forthe upkeep of his parents in Nigeria. All the moneytogether was £1,613.00. I was told that I would appearin a magistrate court to prove the money was not meantfor crime or proceeds of crime. The officer told methat they will like to see traceability and that Ineeded my payslips and bank account detailing mypayments and withdrawals as well as my cousin'spayments and withdrawals.I was released but without the money. I made my way toterminal 4 and arrived there at about 12:30am but theBritish Airways kiosks were closed. I was directed tothe staff room and told them that I wanted to rebookmy trip to Lagos. A lady told me to give her my ticketand she stated that British Airways has banned me fromtravelling with them indefinitely and that only themanagers can use their discretions because I was a'disruptive passenger'. I requested for my 2 pieceluggage and she told me that the section will beopened later at about 5:30am and I will be escorted into collect them. I slept on the chair and waited tillabout 5:30am and attempted to rebook my ticket but wastold that British Airways refused to take me. Idecided to go and pick up my stuff and I was told thatmy luggage were missing. I was handed a form withreference number LONBA90924. At this point, I becametotally stranded because I could not leave without myluggage because it contained my brother's weddingsuit, shirts and accessories. I was on the phone with my wife and she wanted to bookan alternative flight that departs at 10:15am so thatI could make it for the wedding. This was not possiblebecause British Airways refused to disclose where myluggages were and did not remove my luggage from theflight when they called the police to arrest me. On Monday 31st of March, I appeared at the Magistratecourt but was told that a decision was made about the£1,613.00 that was seized from me. The police had beengranted a further 90 days to hold on to the moneypending their investigation. I was given the officer'sdetails . He requested 12 months bank statements and 6months payslip to prove that the £473.00 that belongsto me was not proceeds of crime and also requestedthat the £1,050.00 that was given to me by my cousinfor his parents should also be traced to my cousin's12 months bank statement and 6 months payslip. DCWebster has promised to write me detailing theserequests.Still on Monday 31st of March 4 days after I was takenoff the plane, I made extra efforts to find out thewhereabouts of my 2 piece luggage (LONBA90924),because they have not been sent to my address aspromised by calling the lost baggage section at13:44hrs and spoke to a man called Neil who said that,it is difficult for them to trace my bags and thatthere is a strong possibility that they might be inLagos. He suggested that I should call back in 24hours. Eventually, one week and one day later, my bags werebrought to me at home. One was badly damaged and theother was intact. British Airways delibrately madesure I missed the wedding because if they were kickingme off their flight, they would have removed my bagsfrom the flight. They were all there when the policeofficers made me to sit on the floor and heard mepleading to allow me fly for my brother's wedding. Icould have made either KLM or Virgin Nigeria thefollowing Friday morning.I will not want to believe that the authoritiesinvolved in the situation deliberately or cleverlypunished me unnecessarily out of frustration for notbeing able to restrain or subdue a deportee or that Ias a fee paying passenger was accused of affray withviolence when I was voicing my concerns about thedisturbances caused by the deportees. I nevermentioned any abusive or swear words neither was Iphysically threatening anyone. My luggage mysteriouslywas lost and I have been banned on all British Airwaysflights without a chance to say my part of the storyto redeem myself. 135 passengers were asked to leavethe flight because they expressed displeasureregarding the disturbances caused by the deportees andthe officers trying to restrain him. My ticket waseven refused to be endorsed by BA to enable me to flywith another airline. I need full compensation of myloss and also a letter of apology from BritishAirways. A British Airways captain ordered 136 passengers offhis plane in chaotic scenes after they all startedcomplaining to cabin crew.As the flight waited to take off at Heathrow the rowwas sparked by the restraint of a man being forciblydeported.Many were distressed by his pitiful cries of "I godie" and one passenger, Ayodeji Omotade, 39, spoke upon his behalf.The deportee was taken off the Lagos bound jet byimmigration staff and police.But five officers returned and arrested Mr Omotade.This outraged the other 135 passengers in the economyclass section and they complained to cabin crew.Amid riotous scenes in the aisles, 20 police officersboarded to calm everything down.Then the BA pilot took the extraordinary decision toboot off everyone who had witnessed the arrest of MrOmotade, an IT consultant from Chatham, Kent.The captain took the view they were all guilty ofdisturbing the flight, although no more passengerswere arrested.After the economy class section was virtually cleared,the deportee, aged about 30, was brought back on andthe flight left.The passengers were booked on to later flights but MrOmotade was told by BA staff he was banned by theairline for life.English-born Mr Omotade, married with a daughter agedfour, was handcuffed and kept in police custody foreight hours after his arrest. He has not been chargedand is seeking an apology from BA.He was travelling from Heathrow's Terminal 4 to Lagosfor his brother's marriage and had in his luggage thegroom's wedding ring, shirt and suit. He missed theceremony.He told the Mirror: "There were agonising noises froman individual being restrained. It went on for 20minutes. "I pleaded with the officers and my exact words were,'Please don't kill him. '"I was not swearing or threatening. BA staff said theofficers were doing their jobs and nothing was goingto happen. When he was removed we thought it was theend of the matter. "But police officers came back and I was handcuffedand dragged off the plane. "He claims his luggage has been lost and £1,600 cash hehad for relatives has been taken and not returned.Scotland Yard confirmed: "A man was arrested foraffray and causing a disturbance and was bailed. "Ba said: "Police were called to the BA75 service toLagos on March 27 after a large number of passengersbecame disruptive.Many were removed. "We take any threats against our crew or passengersvery seriously and this kind of behaviour will not betolerated." Nigerian preacher and healer Pastor Chris Oyakhilome has been accused by a member of his own church of staging miracle healing sessions. Some of his followers have said that he has been hiring people to pretend to be sick and disabled and then “be healed” during his television shows and public prayer meetings. Last weekend Pastor Oyakhilome hosted an all-night prayer at the stadium. The source told Sowetan that he started attending Christ Embassy church in Randburg last year. He was recruited by one of the pastors and told he would be paid if he helped to draw crowds. “The pastor told me that they were looking for people to work for the church. The source also said that the people who are “healed” every time on stage are actually trained weeks before. “Even children who are healthy are whisked around in wheelchairs. Some use crutches. “Everyone is allocated a person who tells the congregation about your background, your specific illness and suffering. “The pastor then raises his hands and places them maybe on your legs if you cannot walk, and a few seconds later you get up and walk around the room,”the source said. He said he called the church the day after their offer and turned them down. “I just told myself that using the word of God to lie to desperate people is immoral, so I refused to take up their offer,” said the source. A woman who went to the all-night prayer service, said: “When he started healing people, I did not see him call anyone from the audience. The people that he ‘healed’ came from a certain section of the audience and it looked like he came with them especially for the event. “I saw a lot of people in wheelchairs leaving the venue who had not been healed. It was very sad. ”Lerato Moeketsi told Sowetan she was a loyal follower of the church and was disappointed that she could not make it into the stadium. “I had to turn back because the stadium was full. “There was no way I could go through to receive his blessing,” she said. Thousands of followers jostled for space at the stadium. The seriously ill, mostly disabled and in wheelchairs, went to the service in the hope of being healed by Pastor Chris’s powerful prayer. Another woman, Tshinanne Nemutudi, said she went to the all-night prayer service because she believed in Pastor Chris. 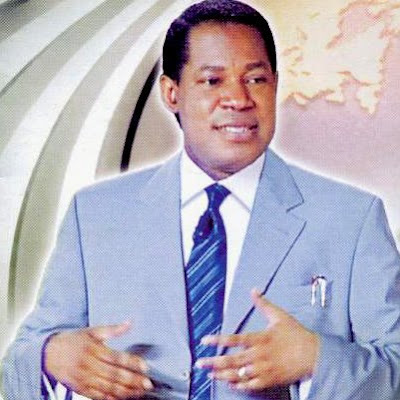 Oyakhilome ’s website describes him as a pastor, teacher, healing minister, television host and best-selling author whose career spans 25 years. He runs the church with his wife, Pastor Anita, who is the director of Christ Embassy’s international office and also preaches at the Christ Embassy churches in the United Kingdom. Pastor Chris also hosts a religious programme on TV called Atmosphere for Miracles. At the Randburg branch, brother Onyeka Liozo said what the source and the followers said “was rubbish”. “We have a healing school in Randburg. People ask and get healed. People must stop lying about this holy crusade,” said Liozo. He said that people come from outside South Africa for help. Pastor Chris is both controversial and mysterious. The press is barred from taking pictures at his healing services. As usual, self-styled Afenifere spokesman, Yinka Odumakin, was at his hypocritical best with his comments on our repeated attempts to run an open government in Ogun State. His review of His Excellency, Otunba Gbenga Daniel's, Mr. Governor Explains This, was characteristically a PhD affair (Pull Him Down). The quarterly programme, which is usually broadcast live on radio and TV ensures that residents of the state ask pertinent questions from the Governor without ANYONE acting as intermediary. But I'll reserve my comments about Odumakin's opportunistic remarks for now, while giving you the response of the Ogun State Commissioner for Education, Prof. Segun Awonusi. It is a shame that Yinka Odumakin could misread the import and the ideological mindset of the Ogun State Governor, Otunba Gbenga Daniel’s, response to a public discourse. The truth must be said that Governor Daniel remains one of the few who hero-worships the late sage, Papa Obafemi Awolowo, in particular his free primary education policy at a time many other Nigerian premiers and their regions could not face the challenge of education liberalisation. It must also be pointed that Papa Awolowo's free education was limited to PRIMARY level not because Papa did not wish to go beyond that level but the economic realities of the day did not allow it. The thesis therefore is that it a combination of ideological commitment and economic realities at a particular time that are the twin indices that determine policy costing or more specifically the freedom, a la limited or absolutus of free education. Given the basic understanding of public policy philosophy outlined above, society should therefore praise the operators of the state apparatus like Governor Daniel who not only assured that PRIMARY education remains free, in spite of its collosal cost that even the federal Government had to come to the aid of states through UBEC (never mind the policy that over centralises fund adminstration in a federal context) and ensures that SECONDARY education is tuition free and in addition in the case of Ogun State, university education fee is kept at a very low level. An example will suffice. In the last six months the Management of the Olabisi Onabanjo University had insisted that to maintain quality education which had become expensive, it would charge the actual cost (100%) that it takes to provide education as determined by the Nigerian Universities Commission. Governor Daniel said no and said OOU must consult with stakeholders which include students, staff unions, parents associations etc and the Stakeholder' brought the fee down by 50%. When the Governor still listened to the cries of the people he directed his Commissioner of Education (incidentally an academic who also benefited from Papa Awo's free primary policy) to reduce the agreed fee structure. Consequently Gov Daniel's administartion reduced that by another 25% such that at the end of the day the universiity is charging only 25% of the original fees which ipso facto translates into a governmental subsidy of 75% of the fees. A similar reduction in student fees by Gov Daniel at the state oldest polytechnic (where N17,000 fee reduction was made to bring old students fee to Zero% increase over last year's fees) has suddenly forced the Government to see how it has to address a budget shortfall of over N150 million in that sector. A second example lies in the totality of what is being spent to maintain qualitative education in the state. Ogun State remains one of very few states in Nigeria where the Governor spends over 26% of her budget on education, a policy which clearly meets UNESCO recommended international standard in an age when even the Federal Government (that is awashed with a lot of money) has just moved from 8% to 13% in the 2008 budget. It is therefore unrealistic to insist on education fees-freedom absolutus unless we want Gov Daniel to spend 75% of the state budget on education so that there will peanut provision for other equally demanding social services like health, environment, housing etc. The issue of population explosion referred to by Gov Daniel can better be appreciated if one realises that by the projection of the founding fathers OOU was expected to have a population of 15,000 in 2007 but in reality has 62,000. This is apart from Tai Solarin University of Education which has over 8000 students apart from the 5020 NCE students in the same university. Faced with this shocking reality the State Government is committing enormous resources to education. Besides, the Government has employed over 7000 teachers in the last four years in counter distinction to the 600 employed by the previous administration in the same time-span or period. Government has invested a lot in computer education that 92% of secondary schools have computer labs, the years of decay and atrophy in structural dilapidation is now addressed through automatic monthly release of fund that totally eliminate rehabilitation needs within 24 months apart from the investment in tertiary students busary awards and payment of WAEC fees. Odumakin needs to wake from the lull of unchallenged and economically-untested ideological lull and if has no courage to see and commend Governor Daniel for such giant steps, he should have at least the candour to keep mum in the face openly discernible progress. Prof. Segun Awonusi is the Ogun State Commissioner for Education. Treason trial of Nigeria’s Militant leader, Mr. Henry Okah, begins today Thursday, at the Federal High Court in Jos, Plateau state North-Central of the country. The trial of Okah, leader of the Movement for the Emancipation of the Niger Delta (MEND), according to the Director of Public Prosecution will commence at one o’clock this afternoon. Also to be tried today, is Mr. Edward Atatah, the second person charged along with Mr. Okah in Angola. On Wednesday, the MEND leader had asked the Federal High Court in Abuja to set aside the order for his secret trial. 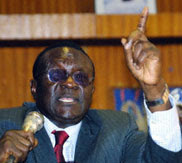 In the processes filed at the Federal High Court through their lawyer, Mr. Femi Falana, Okah and Atatah urged the court to vacate the trial and make their trial open. The accused persons alleged that they are yet to receive copies of the charges filed against them. They added that since the government had told the whole world that the accused persons were gunrunners and planning to topple governments, it would be fair to make their trial open and allow the public conscience to judge the proceedings. The Federal Government in a 14-count charge, accused Okah of treason, terrorism and also linked him with the disappearance of weapons in the Nigerian Army Central Depot in Kaduna, North Central Nigeria. Prosecutors made the 14 charges public at the resumed hearing of the lawsuit filed on behalf of Mr. Okah and his co-detainee, Atatah at the Federal High Court Abuja, the nation's capital city on March 5. Mr. Okah and Mr. Atatah were both accused of treason, terrorism and illegal possession of firearms. The Prosecutor said that Mr. Okah bought over 6000 assorted rifles ammunition from some military officers who are currently in detention for missing arms at the Nigerian Army ordinance depot in Kaduna. He was said to have provided the weapons to Militant Groups in the Niger Delta with the intention to intimidate and overawe the Federal Government. The Prosecutor said that Okah and his co-accused were arrested on 23rd last year in Angola while trying to buy a Korean shipping vessel worth 670,000 US dollars for the purpose of transporting weapons to Militant Groups in the Niger Delta. Okah and Atatah were extradited to Nigeria by Angolan authorities mid-Febraury after their arrest and detention on September 3, 2007. In an e-mail statement to journalists the militant group accused both governments of carring out a secret illegal extradition of Okah back to the country at night. The group claims Okah was beaten, shackled in ankle, cuff chained and blind-folded with a hood before being flown out of Angola under the cover of night to an undisclosed location. Both Henry Okah and Edward Atatah were taken into custody, at the National Department of Criminal Investigation in Angola by security agents in Angola Mr. Okah for allegations of gun running though the militants claim their leader was being wrongly accused of the crime. He was said to have been arrested at the Passport Control Area of the Luanda International Airport while discussing on phone and escorted to the SAA counter by two security operatives, after which he was taken into custody. While demanding their release, shortly after the arrest, MEND said the allegations of gun-running against him were mere fabrications, and threatened the Federal Government for its role in the matter. 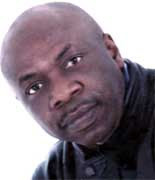 According to the militants, Okah had gone to Angola on a business trip to inspect a ship he was to purchase. They also said the mandatory 106 days, which the government of Angola is authorized to keep a person in detention without bail, had expired. On January 13 however, the militant group said in a statement that it would halt the attacks in Nigeria's Niger Delta region if its leader Okah was released. MEND shot up to limelight two years ago after a series of kidnappings which targeted expatriates in oil multinational companies in the Niger Delta and sabotaging oil installations, cutting Nigerian output by nearly one quarter. If convicted Okah and Atatah risk death penalty. During the week, MEND disassociated itself from the proposed Niger Delta Peace Summit being planned for the month of April, 2008. MEND said in an e-mail, that a summit without the basic ingredient of sincerity and the presence of key players such as Okah and others marked for arrest is unacceptable. The Niger Delta militant group said that Mr. Okah must be in such a forum as an active participant and not on the agenda for discussion. “Those so-called elders, compromised militants and youth leaders who are clamoring for hand-outs and recognition from Abuja, by accepting to attend are doing so for their own selfish interests,” the group said. MEND says that if the summit does hold, it will be just another circus that will end in failure as key issues will not be addressed and those that will participate do not have the capacity to guarantee an enduring peace. LET me start with a confession. I would have written this article several weeks ago, but for fear. Yes, fear - or something close to it. The subject is the forthcoming American presidential election which, because of the critical place of primaries in the process, can be said to have even started. My position on this matter is, to put it very midly, that there is no reason for us to be excited or emotional about the possibility of a blackman or a woman becoming the President of the United States of America - for the first time. I had feared that this position would be unpopular even with most of my remaining comrades. I was simply not in the mood to provoke another round of private rebukes. On the other hand, there was no way I could "water down" this strong feeling that we are being diverted by an exercise whose result would make little or no difference - one way or the other - to the conditions of the wretched of the earth" - be they nations, peoples or individuals. So, I decided to shelve this article and rather continue to follow the interest generated by the historical possibility of either Barack Obama or Hillary Clinton succeeding George W. Bush as American President in January 2009. I also decided to continue to follow the primaries and the debate on the relative chances of these two "makers of history" and the desirability of victory for one or the other. I watched as sharp divisions started to grow in the ranks of those who hope for a "historical change" in America. With time there appeared, in the Nigerian media, "Obama supporters" and "Hillary supporters". I continued to hope that something would happen to dissolve my fear of intervention. As I waited I remembered what Samir Amin once said, namely: that there are no "separate Democratic and Republican parties". He recalled that Julius Nyerere, the first President of Tanzania, joked that what existed in America was "two single parties". Amin explained further: "Vote Republican, vote Democrat, it makes no real difference when your future does not depend on your electoral choice but on the uncertainties of the market". Nyerere and Amin were referring to American voters. But their conclusion applies even more forcefully to most of the people living outside America. I am not sure the term "two single parties" obeys the rules of English grammar. But historically and politically, it is an appropriate term. The United States of America entered the Vietnam War in 1946 - after World War II. It entered the war as an ally of the colonial power, France. Harry S. Truman a Democrat, was the American President. The Vietnamese leader, Ho Chi Minh, wrote a passionate letter to President Truman urging him not to support the French but to extend the fruits of Hitler's defeat to the Vietnamese people. Truman ignored the letter. Ten years later in 1956, after the Vietnamese had defeated and humiliated the French colonialists in the battle of Dien Bien Phu, America took over the war. Dwight David Elsenhower, a Republican, was the president. John Kennedy, a Democrat, did not stop the war during his brief tenure as President (1961-1963). Lyndon Johnson, also a Democrat, who took over the presidency after Kennedy's assassination in 1963, did not stop the war. In fact the most savage battles of the entire war took place during Johnson's presidency. Richard Nixon, a Republican succeeded Johnson. He too did not stop the war. The war came to an end under Gerald Ford, a Republican. The 1961 abortive invasion of Cuba, the "Bay of Pigs" invasion took place under President Kennedy, a Democrat, a genuine liberal and a Roman Catholic. The NATO war in the Balkans, led by Americans in the 1990s was directed by George Bush (Senior) (Republican), and Bill Clinton (Democrat). The First Gulf War was fought under Bush (Senior) (Republican), and continued by Clinton with unrelenting intensity throughout his tenure. The wars in Iraq and Afghanistan will continue after George Bush (Junior). As I reflected on this segment of world history I continued to hope that an end to my fear would soon come. It came on Sunday, March 2, 2008. My fear vanished after reading an article posted in the internet. Written by an American, Kavila Mandini Ramdas, who is currently President of the Global Fund for Women, an organisation based in the United States of America, the article carries the title Leveraging the power of race and gender. The premise of the article is in its last two sentences: "What is at stake in this election is not merely the historic first that would be accomplished if either a black man or a woman became the next U.S. President. What is at stake is the fragile future of our shared world". Before that, she had lamented: "There is something profoundly wrong when a conversation about qualifications to be President of the most powerful nation in the world ignores the reality facing most of that world's inhabitants". Reading through Ramdas' article, I saw that no self-respecting democrat or liberal in Nigeria or in America, would be able to publicly oppose her theses. The theses are "provocative", but they are not easy to oppose publicly. My fear disappeared and I recovered my voice. My position on American elections has been the same since I become conscious of American imperialism. But with the emergence of the two "historic" Democratic contenders - Hillary Clinton and Barack Obama - I ask myself, again, if this position does not need a review. My answer is that, of course, it makes a difference - a symbolic difference - that either a woman or a blackman would become the Democratic candidate in the 2008 presidential election. But the real difference is the hope that for the first time, we have candidates, who, by the logic of their social and historical attributes, will be "naturally" inclined to challenge some of the worst inequalities that exist inside America or are promoted outside America by the rulers of America. This expectation has so far, been unrealised in the campaigns of Hillary and Obama. Kavita demands in her article: "I want to hear from the woman running for President why being a woman and a mother matters to her and how it will inform her leadership. I want her to stand up for the millions of women who are not heard here or around the world. I want her to chat her course as the wisest, most humane President this country has ever seen, not to show us how much more macho she can have as our next Commander-in-Chief". Further, Kavita says: "Women in the developing world are not re-assured when they see Madeleine Albright standing next to Hillary Clinton. They have not forgotten that this former Secretary of State, when questioned about the death of more than 500,000 children as a result of sanctions against Iraq, responded that 'this price had been worth it'. Kavita then urges "As a woman and a mother, Hillary Clinton could bring insights and perspectives no other President in U.S. history could have brought to the negotiating table of war and peace". On Barack Obama, Kavita says: "Obama has his own powerful but underutilised tool: race. What prevents him, for example, from drawing analogies between the plight facing women - many of who live in subjugation simply by virtue of their gender - and the experience of slavery". Further: "What is happening when a truly multiracial candidate, whose first name means 'blessing' in Hebrew and Arabic, and whose middle name is Hussein, feels he must spend his moral capital proving his Christian credentials". She continues: "By owning the question of race on an international stage, Obama would have an amazing opportunity to reach out to people worldwide - who are in more need of hope than most American could imagine". I hope that Kavita Ramdas speaks for many of us when she says: "As the stepson of an Indonesian Muslim and the son of a Kenyan and a white woman from Kansas, Barack Obama manifests what it means to be a global citizen"; and that she would like to hear from Obama that "when he looks at the United States or the world, what he sees are not Muslims, Christians, Hindus, Jews or atheists, but simply human beings desperate to be treated with dignity and respect." In one of the editorials in its issue of March 1, 2008, The Economist warned that both Barack Obama and Hillary Clinton were becoming "worryingly populist" in their economic policies. That is blackmail, clear and direct. The paper followed with this cynical analysis: "Democratic candidates always veer to the left during primaries because that is where the votes are. But come the general election, the winner will tack back towards the centre, where the crucial independent voter resides". Blackmail and cynicism: That is the response of the mainstream Western media to Hillary and Obama. So, while we urge these historic candidates to become more radical, the "kingmakers" are saying that they have already gone too far! 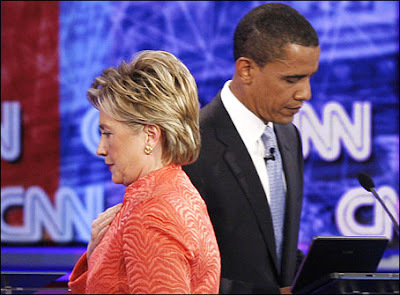 Hillary Clinton and Barack Obama still have the opportunity to make their appearance truly historic - whichever of them eventually emerges as the Democratic candidate and whether that person goes on to win the presidential contest, or not.